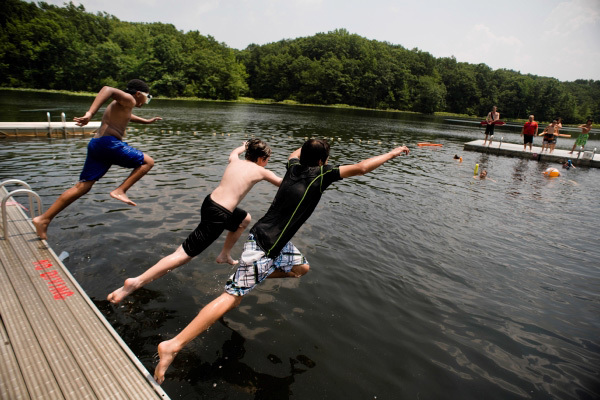 Pouch Camp, located within the 3,000 acre protected Staten Island Greenbelt, has been an important resource for the Boy Scouts of America and youth throughout the region for more than six decades. Pouch Camp has long been a state conservation priority since the mid-1980s. It's a recreational destination, an environmental education hotspot, and supports diverse wildlife habitat and water resources. Throughout its history, Pouch Camp has been managed and maintained in the spirit of protecting these resources. The Greater New York Councils Boy Scouts of America (GNYC) worked with The Trust for Public Land and the State of New York to permanently protect this iconic landscape. The first phase, completed in November 2012, protected with a perpetual conservation easement that the Scouts will continue to use for camping activities, retaining use of the cabins and trails on this portion through a management agreement. In total the project protects 94 acres of the property from development under a permanent legal blanket and expands the existing greenbelt. The agreement allows the Scouts to continue their vital legacy to engage youth from New York City and the region—while expanding public access to the community. Thousands of scouts and youth from throughout the region have their first outdoor camping experience at Pouch Camp each year. The Port Authority of NY and NJ, one of our partners, contributed $4 million, as well as NYS DEC who contributed $6 million to this conservation effort as part of their emphasis on protecting resilient landscapes in the New York & New Jersey Harbor.